A GOAL FROM Kevin McKernan in the dying moments of the first-half ensured Down maintained complete control of this Ulster Senior Football Championship clash with their neighbours to the north. Antrim hit the ground running in Pairc Esler, taking a two-point lead through the efforts of Matthew Fitzpatrick and Patrick McBride, but the hosts soon settled into their own rhythm. Through Caolan Mooney, Shay Millar, Connaire Harrison and frees from Donal O’Hare, Down got the scoreboard ticking. They cranked the pressure up on Antrim’s kick-outs, yielding the crucial goal as Chris Kerr’s kick-out was intercepted by Shay Millar he slipped the ball to McKernan to drive his finish to the net. Already losing a grip on the contest with a four-point deficit, McKernan’s goal left Antrim 1-9 to 0-5 down at the interval and never looked likely to come inside the safe arm’s length Down held them at. Certainly not after a red card for Ricky Johnston. Anthony Doherty’s long-range frees helped him to a haul of three points, O’Hare finished his night with seven points (five frees), while Sean Dornan – on for the black-carded McKernan – contributed two points to ensure Down could start thinking ahead to an Ulster semi-final against either Donegal or Derry, who face off in Celtic Park tomorrow. 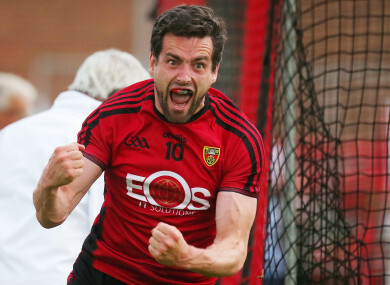 Email “McKernan strike aids assured Down win over Antrim”. Feedback on “McKernan strike aids assured Down win over Antrim”.